One of the most characteristic and charming villages of Italy. Maybe of the entire world. 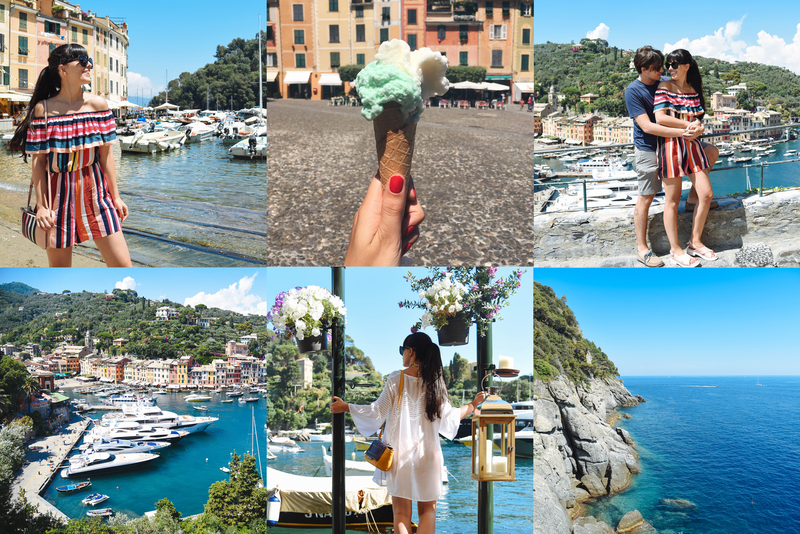 Every time I return I am always more fascinated… Here is my diary of a weekend in Portofino! Portofino is magical and gives the feeling of living in a place out of time. It will be because of it is limited to the cars, there is not the usual noisy traffic of the Via Aurelia and not even the typical Ligurian buildings. Only colorful pastel houses, access to which is managed with ladders and balconies, just as it once was. After parking the car, we walked through the maze of carrugi (the narrow alleyways, characteristics of Ligurian villages) and we aimed to Via Roma, the way of luxury boutiques where literally feast all eyes, until we reached the characteristic Piazzetta. From a distance it looks like a painting, non even real. I think is one of the most perfect and photogenic places I have ever seen in my entire life! Once you reach the Piazzetta and the harbor the choice is vast: the Natural Park of Portofino offers 80 km of trails for hiking in the almost untouched nature. My boyfriend and I chose to go on the road the starts at the right of the port, which climbs up the hill. A fairly easy trail, where we breathed deeply the scent of eucalyptus, myrtle and broom all around. On top there is the Church of St. George, where we were greeted by the chirping of cicadas. Incredibly beautiful as surrounded by nature, it is located in a perfect scenic location to see all Portofino from above! Portofino is a gem but if you are looking for the ideal place to make a weekend at the sea is not for you: the beach is practically nonexistent and the few that are there are usually private, ownership of the villas. But from the harbor you can book an tour by taxi boat to visit the neighboring countries, Rapallo, Santa Margherita Ligure, Sestri Levante and even the Cinque Terre! If you go to Portofino, I suggest you go get a drink in the most famous nightclub of the Riviera di Levante, Il Covo di Nordest. It’s located in Paraggi, close to Portofino, and you have to see it. Built into the rock overlooking the sea, with a breathtaking views across the Gulf of Tigullio! For lunch I recommend you try the restaurant Da I Gemelli. It is located in the harbor of Portofino, an absolutely gorgeous location. The food is excellent: I enjoyed an excellent seafood salad with prawns stir-fried and fresh basil. My snack was an excellent and refreshing ice cream from Gelateria Il Molo (which is also the only of the whole Portofino!). Happy hour in Portofino must be spent in one of the many wine bars along the harbor. I love the Jolly Wine Bar, where it seems to be on board one of the many boats moored in the harbor! For dinner, then, I recommend the restaurant Da O ‘Batti. It’s located in the heart of Portofino, between some pastel-colored houses in one of the narrow streets around the famous Piazzetta. If you can, choose a table outside: it is even more romantic. The typical dish is the prawns and I must say they are really excellent… I had never eaten so good ones! Staying in Portofino if only for one night is quite expensive: the hotels are not so many and prices are incredible high. If you want to treat yourself to a special evening, try the Belmond Hotel Splendido, in the quiet green of the natural park of Portofino. Otherwise, I suggest you move to sleep in the neighboring places, which are also very beautiful, like Rapallo and Santa Margherita Ligure! I hope you enjoyed my travel diary of a weekend in Portofino… I wish you a very happy Friday!